Although they feature prominently in the advertising and, well, the conceit of AMC's newest unscripted series, Ride with Norman Reedus, you don't have to be a gear head or especially knowledgeable about motorcycles to enjoy the show. It's a lot like watching any other concept-based travel series: the entertainment value is in the uniqueness of the experience and the versatility of the host. In that sense, it's akin to Anthony Bourdain's No Reservations, in which he traveled to parts unknown, met interesting people, and enjoyed a chat and a nosh. The excursion and the initial exchange may have centered on the idea of food, but in its heart of hearts, Bourdain wasn't hosting a food show, not really. The same is true with Ride, though the audience's interest in the series may come from a different angle. Being a known commodity of sorts, there is low-key sense of familiarity with the star and narrator of the series. The appeal for many fans may be more the getting-to-know-you aspect of the show than the access Reedus is given to both celebrity friends and movers and shakers in the motorcycle industry, as is made evident in the premiere episode. Perhaps because the character Reedus plays on The Walking Dead has such a reputation for being a laconic lone wolf – who also has a deep, abiding love for two-wheeled motorized travel – it is somewhat surprising to see him take the reins as host of an hour-long show based on his personal experiences and explorations around the world of motorcycle riding – no matter how tangential they may end up being. The series begins with Reedus delivering an introduction of himself and his love of motorcycle riding, cruising through – where else? – the streets of Los Angeles before he prepares to venture up Pacific Coast Highway, which serves as the hour's geographical focal point, filled with plenty of individuals and attractions along the way. If you've ever watched a travel series before, the format should be fairly recognizable: there are cuts to a large map of the area to be traveled, accompanied by a little voiceover, like an eager Clark Griswold detailing the itinerary for the next few days. Although there will be stops along the way, the PCH (as it is referred to) isn't the entire reason for the trip. Reedus is making his way up north to Santa Cruz to make an appearance on a podcast centered on – you guess it – motorcycles and the lifestyle surrounding them. There is a comforting paint-by-numbers approach to the series, which doesn't try to break the mold of celebrity-hosted travel series. Instead, Ride just goes with the flow, which gives the segments more of an off-the-cuff kind of feel than they might normally have. 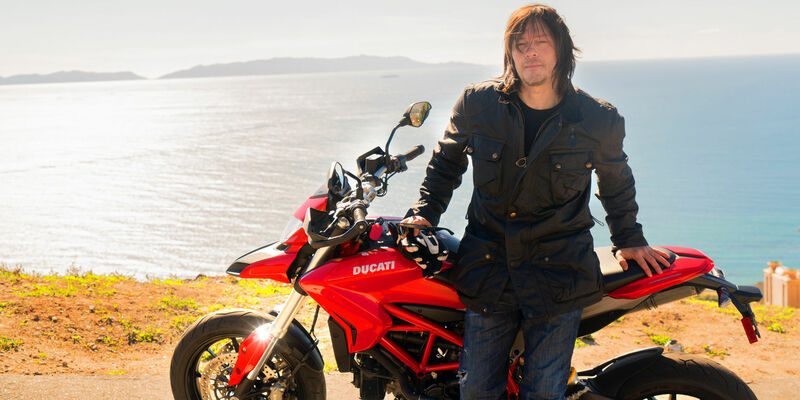 Reedus begins his journey by meeting Roland Sands, a custom bike designer who takes as much a liking to the host's red Ducati, as Reedus does Sands' one-of-a-kind bike that becomes his mode of transportation for the rest of the hour. The meeting with Roland gives the audience an idea of what Reedus' interview style is, and it's not surprising when you find that it's laid back and pretty much without any sort of agenda – he's just kind of getting to know these people and to give them a chance to demonstrate what it is they do so well. Fans of custom-made bikes will probably get a kick out of seeing what's in Sands' shop, and while there's plenty to be gleaned about the techniques he uses and inspirations he draws from, Ride doesn't quite have time to dive as deep as some might like into the inner workings of the shop, and so the interaction becomes something more akin to picking up a rental car with a Hertz employee who goes beyond the call of duty. Reedus spends more time with his next guest, Imogen Lehtonen, a jewelry designer, proprietor of The Great Frog in Los Angeles, and motorcycle enthusiast who becomes Reedus' traveling companion for the remainder of his journey. The shift in the dynamic is welcome, as it gives Reedus someone to play off of and adds a bit of levity to the rest of their journey with unscripted moments like the two of them misunderstanding what the other is saying while on the highway, and again when they take to piloting a pair of dune buggies or when they stop for the night in an Airstream camp in Santa Barbara. It will be interesting to see how the show does moving forward. Reedus has a welcome ease with everyone that he meets or interviews – like the owner of Nitwit Ridge or the owner of Zero Motorcycles – which likely means the rest of the series will have a similar vibe. But as fun and divergent a moment the segment at Nitwit Ridge was, you can't help but ask how it tied in with the rest of the hour. Giving Reedus a reason to be traveling made each stop to meet a motorcycle-friendly compatriot make sense, but the vacation-y aspects of the hour felt a little out of place, especially when so little time was spent offering a reason for the stop in a dilapidated house beyond it being a weird, unique experience. All in all, though, Ride with Norman Reedus is cut of the same cloth as No Reservations and Parts Unknown and countless other shows of the same ilk. While it lacks some of the depth that Bourdain brings to his shows, it winds up being an entertaining road trip nonetheless. Ride with Norman Reedus airs Sunday nights @10pm on AMC.